Original CSF-3 Super Feeder serviceable for years to come, made in USA and sold by Super-Feed for over 23 years! All parts readily available and easy to replace if ever needed. 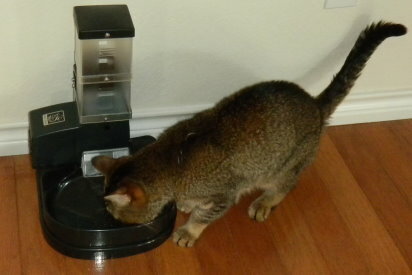 This Smart automatic cat Feeder can be remotely controlled via iPhone or other mobile device. NEW Wi-Fi SUPER FEEDER COMBO by Super-Feed! Note before purchasing: You should be familiar with Wi-Fi operation/set-up to use this system. Your feeder will need to be within range of your own Wi-Fi router at home for it to work properly, but you will of course still be able to control your feeder from anywhere using your smart phone or other device. 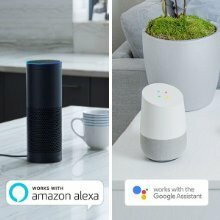 See how Google works for a customer. This Super Feeder combo includes a high-quality TP-LINK HS100 Smart Wi-Fi Plug which will enable you to control your Super Feeder remotely by your mobile device running iOS 8 or higher, Android 4.1 or higher with exixting Wi-Fi network. Making the Super Feeder® even more versatile than the competition, you will still retain the option to use any timer instead of the Smart Plug like used to turn lamps on. Furthermore and perhaps most importantly for customers with multiple pets, you will be able to add and operate several plugs from your iPhone/iPad to control several feeders simultaneously in different locations or two feeders with one Wi-Fi plug fitted with a multi plug adapter. This combo features a dishwasher-safe bowl especially designed to spread kibbles to the outer edge for better access to pets. A metal bracket attaches the feeder to a sturdy and compact black ABS base and tower. This feeder holds 4 and 3/4 cups of food (enough for about 9 days at 1/2 cup per day) and can be easily increased later with extra 2-cup clear extensions or a 1.5 gallon hopper available from Super-Feed®. Chute cover helps prevent pet intrusion! Minor screwdriver assembly . Made in USA, you will love it like thousands of others do! Compact at 10 x 11 x 15 inches tall, placed backed up to a wall, cabinet or across a corner wall, or could also be mounted to a wall or your very own mount instead of the supplied short stand. INDOOR use only! Voltage required: Included Power supply and Wi-Fi plug 110-240VAC 50-60Hz 12VDC output--USA style plugs-not battery operated. NOTE: USING A NAME BRAND LIKE "SCIENCE DIET" IS ONLY A BRAND EXAMPLE. Many brands have similar recommended type kibbles. The TP-LINK HS100 Smart Wi-Fi Plug is perfect to control your Super Feeder® remotely for up to 15 meals/snacks per day. It is one of the easiest we tested to install and use. Just follow directions included with the Smart Wi-Fi Plug. All you will need to do once installed is program suggested 2 minutes of "on" time for each feed cycle time of day you want. Make sure you program "on" and "off" time, i.e. 8:00 AM and off at 8:02 AM for each time of day you want to feed your pet. Also select all or certain days of the week you want to trigger your Super Feeder® to feed your pet. The feeder runs only for time in seconds you previously adjusted the feeder to give you the portion needed and then stops. You may of course trigger your Super Feeder® anytime by remotely turning it on for a few seconds and turning it back off yourself from your device. You may install and operate several Wi-Fi Plugs and feeders simultaneously in different places within range of local Wi-Fi. Note: The feeder must have been powered down for at least 2 minutes between feed cycles to assure it triggers again. If it has not been off long enough like repeatedly turning it on and off, the feeder will not work, which is normal. You could also control the Super Feeder® by voice command using this TP-LINK Smart Plug compatible with Amazon Alexa®. Many ways to operate your Super Feeder®. This is what makes it so unique! Have had this set up for a week now and so far everything is working great with the wi-fi timer. I didn't need to do much customizing except to use a different bowl as my cat didn't seem to like the plastic one that came with. This will make mornings much easier and also taking vacations. Thanks!